slowthai is excited to show me his backyard. When his mum started renting this house in Northampton, the backyard needed work. It was basically just a pile of old bricks, so slowthai dug it all out, laid down some white gravel, put the wall back up. Today, it looks really lovely. The 23-year-old takes me to a bushy dwarf palm tree in the corner, where he apparently sometimes hears strange noises. He tells me he thinks there might be an evil monkey living in it. He picks up a spade and starts shaking the tree to check. No evil monkeys today. slowthai is a very excitable guy – we shake hands three or four times during my time with him, and at one point have a full on hug. He’s also quite famous now. His angry tirade of a breakthrough single, T N Biscuits, cemented him as one of the most exciting new rappers in Britain. Since then, he’s delivered the groundbreaking video for his new song Ladies – basically a feminist critique of street culture – in which he poses naked and vulnerable alongside his girlfriend, who lies fully clothed. As a result of all this attention, these days slowthai often has to travel 67 miles south to be in London. He doesn’t like that. He prefers being in Northampton, it keeps him grounded. When you meet him, he can’t help but tell you stories about the place. Bob Marley played here twice, slowthai will tell you, while wearing a Northampton FC training top with a gold pendant rested over the top. He’ll tell you about the often flooded Aquadrome caravan park he’d play in as a kid, where he bought a VHS of 8 Mile from a barber who sold bootlegs. He’ll tell you about the secret gaps in the fencing around the Northamptonshire County Cricket Club, so you can sneak in for test matches if you’re clever and like cricket (he doesn’t). Even when we’re talking about one of his favourite songs, Weird Fishes/Arpeggi by Radiohead, he qualifies it by telling me that Thom Yorke was born in Wellingborough, Northamptonshire, so, you know, he’s actually one of ours. Even to this day, slowthai doesn’t enjoy actually sitting down and writing lyrics that much. He likes the finished product, and invoking the thoughts, but he constantly feels his mind running frantically for the next line. He’s like that in conversation, too. Sometimes, he gets so enthusiastic about what he’s trying to tell me, that his words slur into one another, like his mouth can’t keep up with his brain. But then he has these sobering moments of verbal clarity where the clouds separate and what he’s trying to say comes across like a great orator standing on a podium. Like a lot of what slowthai does, there is a dualism to the song. He’s also a dreamer. In the second verse, he describes his dream house. It’s a surreal and fantastical place. There’s gates to the grounds, a fountain in the shape of a giraffe, a granite floor car park, black diamonds, Mars bars and glasses of milk. He’s had this exact vision since he was a child, and he won’t stop until he gets there. “I see it as a big farm,” he tells me, “where all my family can come to live.” He likes calling himself a ‘farmer’ – a slur that people from the city often call folk from places like Northamptonshire. “The farmers are coming,” he warns me, in a rare moment of seriousness. 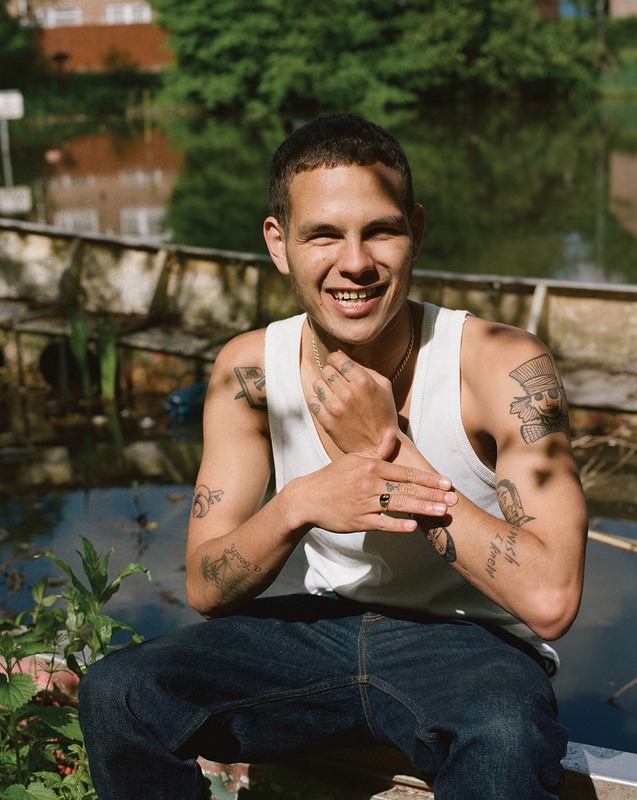 One thing slowthai takes very seriously is his artform. On every song you’ll hear, his vocals have been done in one take, and he cites old blues and soul artists as inspiration for this technique. His live shows, too, demonstrate his respect for the art of performance – often he abandons the stage for long sections of the gig, and ends up in his boxer shorts amongst the crowd. “I want everyone there to perform it to me, then we go crazy and dance, like it’s some mad ayahuasca trip,” he beams, staring right past me. I heard that one time you were brought on stage in a closed coffin? I ask. Speaking of crazy, here’s a trick from slowthai: if you take a bottle of Lambrini and put it to your mouth, tilt your head back and point the bottom of the bottle to the sky, then start spinning while you down its contents, the combination of dizziness, sugar and alcohol intake will make you feel immediately and stupendously smashed. slowthai calls this ‘spinnies’. One of the things that makes him happiest about his recent success is that it might inspire other people from around here to keep making their music or keep writing their stories. In a weird, cross-generational way, slowthai and Alan Moore have something in common: this insatiable love and pride for, and feeling of connectedness to, their town of Northampton, a strange town that sits almost perfectly centre on a map of England. They don’t want to leave home to achieve their dreams, they want to take it with them.